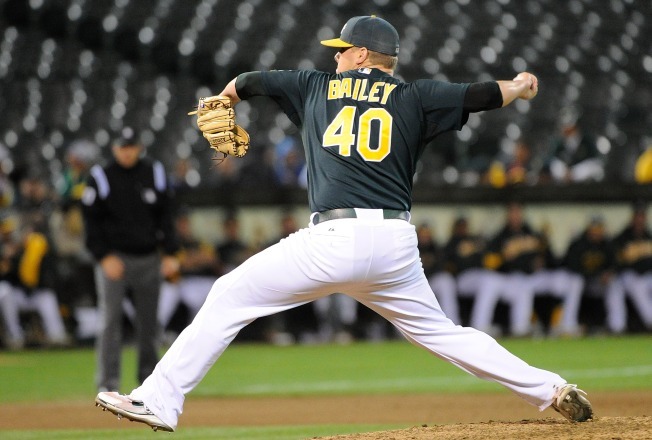 Billy Beane deals Andrew Bailey, Ryan Sweeney for prospects. Andrew Bailey was dealt to the Boston Red Sox for prospects. The offloading continues for the Oakland Athletics. General Manager Billy Beane has traded pitcher Andrew Bailey and Ryan Sweeney to the Boston Red Sox for three prospects. The A's confirmed the report in a release. The move comes as the A's have once again entered a rebuilding mode and shipped its young stars to other teams. Fans had been upset by recent moves by Beane made, including trading pitchers Trevor Cahill and Gio Gonzalez for prospects. Both players had manageable salaries but the A's are believed to be clearing salary and putting the team's focus on a move to San Jose. Reports surfaced over the weekend that Major League Baseball would finally give its approval to an A's move to the South Bay, where the San Francisco Giants currently own territorial rights. But the Giants are reportedly ready to fight any attempt by the A's to build a stadium in downtown San Jose. The A's will receive Josh Reddick, third base prospect Miles Head and right-handed pitcher Raul Alcantara.